Users of natural languages have many word orders with which to encode the same truth-conditional meaning. They choose contextually appropriate strings from these many ways with little conscious effort and with effective communicative results. Previous computational models of when English speakers produce non-canonical word orders, like topicalization, left-dislocation and clefts, fail. The primary goal of this book is to present a better model of when speakers choose to produce certain non-canonical word orders by incorporating the effects of discourse context and speaker goals on syntactic choice. 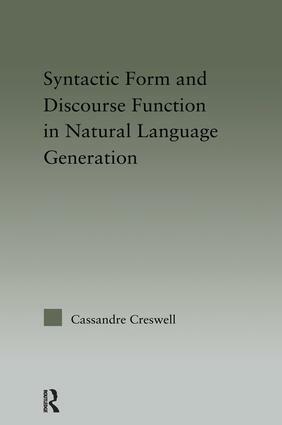 This book makes extensive use of previously unexamined naturally occurring corpus data of non-canonical word order in English, both to illustrate the points of the theoretical model and to train the statistical model.